Guys, if you are asking me about the history of Tofu Manchurian or even Manchuria, I really can't say much. 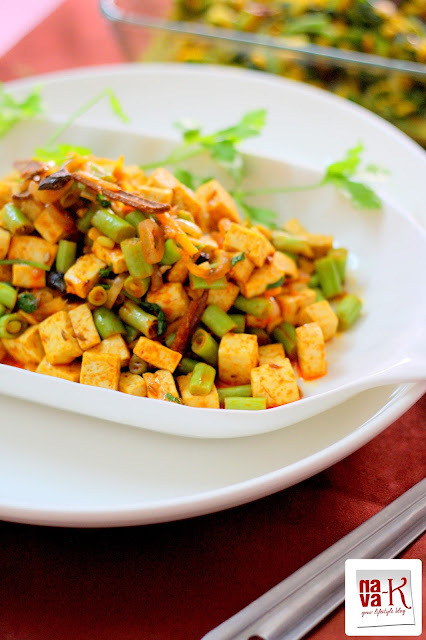 But I sure know that Manchuria was the puppet state of the Empire of Japan in Northeast China and inner Mongolia, and Manchurian cuisine seemingly has taken a strong influence in India (Indian Tofu Curry). Why, how and what, please don't ask me. Yet I am aware that somehow Manchurian recipes (Chicken Kebab & Hakka Noodles) have been tweeted to the local tastes in India and one of the most prominent is definitely Gobi Manchurian (Cauliflower Pakora) and I must include Tofu Manchurian as well. Regardless, my Tofu Manchurian is an outcome of my thinking, though I did refer to a couple of recipes which really confused me. Thus, to keep my Tofu Manchurian as my invention, I went ahead and cooked it as how we would appreciate a tofu dish to be (Tofu Green Beans Stir Fry, Tofu Scrambled Eggs & Spinach Tofu Stir Fry). Of course we must not discount spices and chillies for Manchurian dishes? Precisely the ingredients that were cooked alongside tofu and since I had some French beans, I added them as well. The outcome? This mouthwatering burst of Tofu Manchurian (Tofu Katsu & Chinese Tofu Soup). 1 block of white firm tofu - cut into small squares. 15 French beans/kacang buncis - remove strings and slice to 1/4 inch length. In the heated oil, gently fry the tofu squares, just to brown them on both sides. In the same oil, fry ginger, shallots and spices for 1-2 mins. Add curry powder and beans. Stir in and sprinkle some water. Cook till beans are softened. 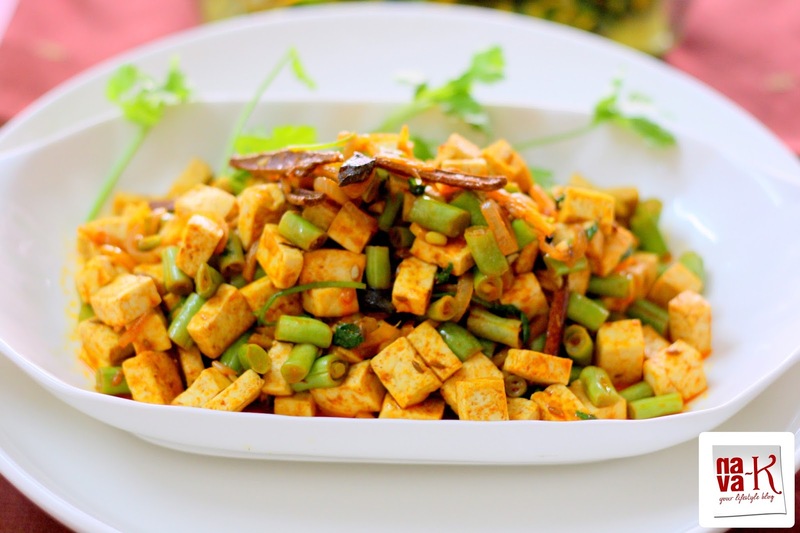 Add in fried tofu squares, salt and coriander leaves. I sure can relate to that Nava *chuckle* My boys love having tofu this way. I haven't added beans before but tender beans will taste so good!! Your white dishes make the ingredients stand out! Lovely! We all food bloggers do the same :) Love the combo of beans and tofu, looks delicious. I have full time jobs about 50 hrs/week and I'm still blogging no $$ from my blog,but it's my passion,my diary of cooking and recipes,I love to share with family,friends,neigbors and blogger. love to read your write ups. love the combo , looks so delicious. Lol...good "intro". Your other half also very understanding. Love your dish, may be i should try out this recipe. sound good. I love this post Nava. . Its the same thing here. Hence I decided to do cooking for the blog mostly over the weekend and then post it in the coming week. . Trust me its less hassle :) the dish looks delicious and healthy too. .
Nava, you spoke the words from my mouth. Although I don't work for someone but working for my husband and being a business partner takes lot of time on top of that I cook three meals. And then we are very socially active. I often have to find time to write. also I love my sleep and reading habit. Sometimes I wonder, too why I started blogging? I really love that just like me you post the dishes that you cook for your family and not what you cook for the blog. I don't make tofu more often but when ever I do I cook it in a scrambled way or in stir fry, just the way you did. You are absolutely right and on the dot on everything that goes beyond the scenes Nav. It's hard work and the best part is we love the process. The beans and tofu looks so fresh and tasty. The pics have come out so good. I can understand how difficut it is to take pics, i do the sane spend hours clicking and if i ask someone to take pics for me, i end up itritating that person..
Haha 'my poor hungry other half'. So true. So true. It becomes such a production doesn't it? Our very own 'lights, camera, action' where the stage is filled with food instead of actors and we play the part of writer, director, casting agent and critic. Love your intro part.. Tofu is one of the ingredient I never played with.. after seeing your recipe, I am planning to buy tofu..
love the combo ...healthy stir fry and it looks so good.. Yes I take long time to post a single post, I always admire people who post everyday. I can't do that with two little ones, I am happy What I can. Yes every foodbolgger can relate to what you said. 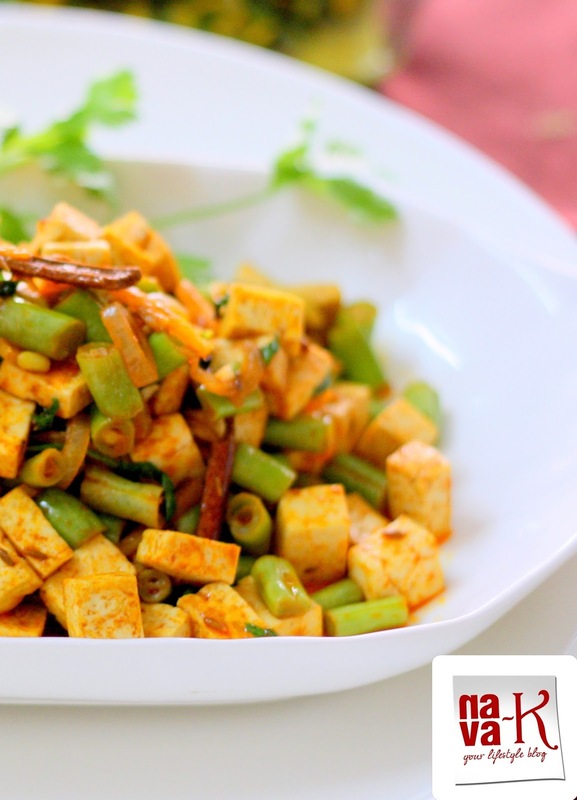 Lovely masala tofu with french beans. A healthy protein meal! Quite simple to make and certainly very tasty! I can't afford to post so often. I often have to plan ahead and my photography itself took me more than an hour. And I practically turn my kitchen and living room upside down. I salute some bloggers can post up to 3 to 4 postings within 24 hours or one posting everyday. I like your this tofu and french bean combination. Very appetizing. Regards. Lovely write up,I take a long time to post recipes,specially editing parts etc...the dish looks delicious.